The summer between my junior and senior year I did a training camp called Trinity Sports Camps, which was run by Scott Olson, my track coach, and was an excellent time for getting some intense training in before going into my senior year. Unfortunately, I was way out shape at that point from vacationing for about a month leading up to camp, but it still helped me for one of the biggest incidents in my sports career. It was a little over half way through football season, and I got tackled while going in for a touchdown. My leg was planted and bent sideways, and the rest of my body was forced down from the impact. When I got up, I could feel something was not right. At the time I didn’t know, but I had a grade 2 MCL tear. Again, it was only because of the training I had done up to that point that saved my knee partially and didn’t end up tearing the MCL as well as the ACL completely. The doctors saw the MRI scan and told me I wouldn’t be able to play for the rest of the season, but I ended up only missing one and a half games. I immediately went into some big time rehabilitation from the moment the injury happened. As a result of the injury and rehabilitation process, my muscular system changed significantly, as well as my running stride. I had not run extensively during the remainder of the football season except when playing in games, and it still hurt and I had to be careful. Once the season ended, I decided not to play basketball, but rather continue training through the winter to get my knee totally ready for track. Scott changed up my training for a couple weeks to help develop some quick strength and power in an effort to save the season. I did about a 3 week period right in the middle of my season of very intense lower body lifting, which didn’t help at first. Surely enough though, I ran some better races, and each week that passed, I noticed a little more spring coming back to my stride. Finally, just as the district meet came around, I ran a 52.11 in the open 400. I was back to where I needed to be. Then the strangest thing happened. 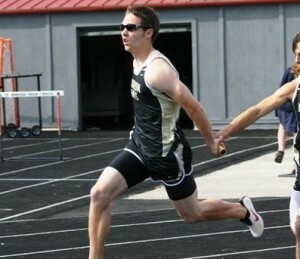 It was probably about 20 minutes after my 400 that suddenly out of nowhere my right hip flexor started hurting. It felt like I had strained it, but for some reason I hadn’t noticed it while running my 400. I was forced to choose between running either the 200 or saving myself for the 4×400. I chose the 4×400 and jogged the 200. With three of my teammates depending on me, I knew I had to give it a shot. We warmed up, and my hip flexor was hurting really bad at this point. Once I got into the race though I was able to push it out of my mind. I usually anchored, but we decided that I would run third. Unbelievably, I ran the best relay leg of my life with a 51.5 and put our team in first place handing off to our last runner. We ended up getting second, but still it was a school record and my best run up to that point. Next, I will talk about my training over the following summer and my preparation to run track in college, as well as the results of going back to a more traditional style of training.